In 1892, the grisly murders of Whitechapel prostitutes four years earlier by a killer dubbed Jack the Ripper remain a terrifying enigma. And in a packed Old Bailey courtroom, Superintendent Thomas Pitt’s testimony causes distinguished soldier John Adinett to be sentenced to hang for the inexplicable murder of a friend. 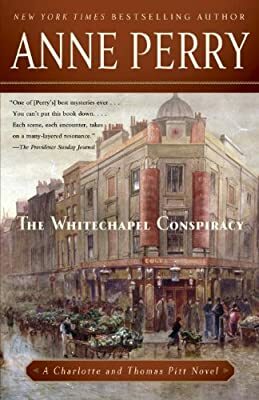 Instead of being praised for his key testimony, Pitt is removed from his station command and transferred to Whitechapel, one of the East End’s most dangerous slums. There he must work undercover investigating alleged anarchist plots. Among his few allies are his clever wife, Charlotte, and intrepid Gracie, the maid who can travel unremarked in Whitechapel. But none of them anticipate the horrors to be revealed.